A few more puzzles to add to the cache. A 221 piece puzzle of my favorite movie poster of Captain Jack Sparrow (Johnny Depp) from The Curse of the Black Pearl (2003). Boris Vallejo, 132 pieces, Hieroglyphic Egg. Fancy Oriental Fish were a near constant part of my childhood in Asia. And not so oddly, have symbolic meaning in my dreams to this day. Boris Vallejo, 117 pieces, Britorgan. There's some fantastic twisting tale that goes with this piece. But I thought a winged unicorn, a dragon and a dragonslayer make for a lot of colorful interest for this puzzle. 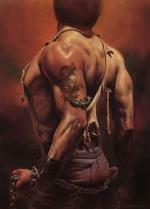 Boris Vallejo, 96 pieces, Tattoo. See my other post- "Free Anatolian Puppy Jigsaw Puzzles With a Side of Shrimp!" for info on these jigsaws. Mmm, Captain Jack :) Yet another thing to distract me from working, but in a good way!